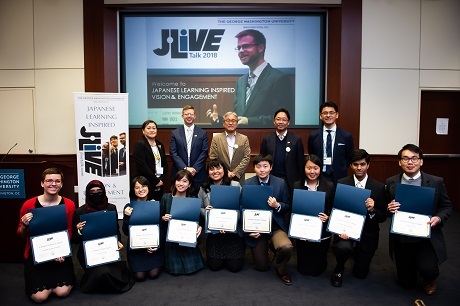 The final round of the fourth annual J.LIVE (Japanese Learning Inspired Vision and Engagement) Talk was held on Sunday, November 11th at the George Washington University. The presentation contest is open to college-level learners of Japanese in the United States, and the nine finalists who competed on Sunday were selected on the basis of their initial video statements from amongst close to fifty entries from twenty-one institutions around the nation. The contest continues to grow each year. On Sunday morning, the nine finalists delivered their dynamic presentations to a full audience at the Marvin Center Amphitheater. A panel of final round judges—Mr. Takehiro Shimada of the Embassy of Japan; Mr. Hiroyuki Takai of Sumitomo Corporation of Americas; Dr. Takakazu Yamagishi of Nanzan University; Dr. Tomoko Steen of Georgetown’s School of Medicine; and Mr. Clark Munson of One Planet Corporation—considered the speakers’ linguistic proficiency, confidence, ability to engage the audience, and the vision expressed in their presentations. The judges also had a chance to test each speaker’s interpersonal skills through a short question-and-answer session in Japanese. Audience members were also given the chance to question the presenters in Japanese, although these exchanges were not officially weighed by the judges. Cash awards of $300, $200 and $100 were presented respectively to the Gold, Silver, Bronze award winners of each category. Gold award winners also received prizes in the form of study trips to Japan. The Category I Gold award winner, Ms. Rida Mughal, received a scholarship for an eight-week summer intensive Japanese language course at Nanzan University in Nagoya, Japan, along with an round-trip ticket from the U.S. to Japan on ANA and a living stipend of $3,300. The Category II Gold award winner, Ms. Barbara Chen, received a scholarship for a six-week summer intensive Japanese language course at the Naganuma School in Tokyo, along with a round-trip ticket from the U.S. to Japan on ANA and a living stipend of $2700. The Category III Gold award winner, Ms. Zizhou Azusa Wang, received a scholarship for a six-week summer intensive Japanese language course at International Christian University in Tokyo, along with a round-trip ticket from the U.S. to Japan on ANA and a living stipend of $2700. Furthermore, Ms. Sandra Silva received the special Kakehashi Award, which entails participation in an all-expenses paid group tour of Japan sponsored and organized by the Japanese Ministry of Foreign Affairs and the Embassy of Japan in Washington, DC. The trip will occur in early 2019. Ms. Silva was selected for the award on the basis of her suitability to represent the United States as a “friendship ambassador” and on the merit of the topic and delivery of her presentation. The attendees of J. LIVE Talk were also able to network with guests from various sectors of the Japan-related community of the Washington Metro area. The JET (Japan Exchange and Teaching) Program; JPT America, a distributor of Japanese books in America; the Japan-America Student Conference; and Matsukawaya, a traditional Japanese sweets maker, hosted informational booths. The program of events concluded with a special screening of the film Bushi no kondate [A Tale of Samurai Cooking: A True Love Story] (2013), sponsored by the Japan Foundation. Student volunteers from GW’s Japanese program staffed the event throughout the day and were integral to its success.